OptiBac Probiotics For every day is a daily supplement containing carefully selected strains of natural bacteria and Fructooligosaccharide fibres. The 6 different strains of live cultures are scientifically proven to reach the gut alive. OptiBac Probiotics For every day is guaranteed to provide a daily dose of 5 billion live cultures. The natural bacteria in this product is combined with Fructooligosaccharide (FOS) fibres. 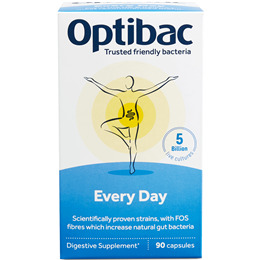 OptiBac Probiotics For Every Day provides a high potency and a select variety of well documented probiotic strains. In addition to this, For Every Day is free from sugars, fats, preservatives or colourings that may be found in other foods or drinks containing live cultures. Great general probiotic for anyone looking to support digestive health Premium probiotic to support digestive health in those seeking a high strength dose. In particular those with digestive concerns, yeast concerns and skin concerns. Vegetarians, pregnant women, breastfeeding mothers and coeliacs. Vegetarians, pregnant women and breastfeeding mothers. 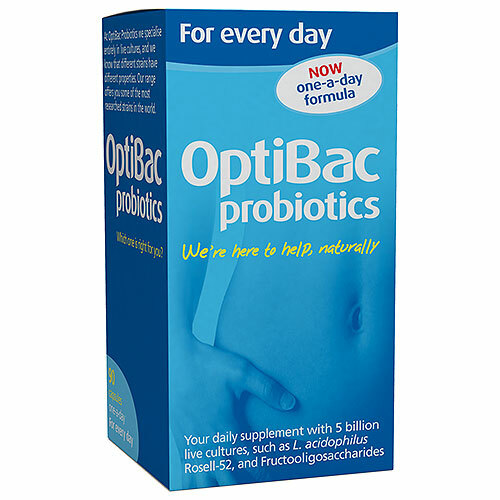 OptiBac Probiotics is a UK company which specialises in probiotic & prebiotic supplements. For Every Day is the best-selling product in the OptiBac range. Potato starch, Live cultures: (Lactobacillus rhamnosus Rosell-11, Lactobacillus acidophilus Rosell-52, Bifidobacterium longum Rosell-175, Lactococcus lactis Rosell-1058, Bifidobacterium breve Rosell-70, Bifidobacterium bifidum Rosell-71); Fructooligosaccharides (FOS 44mg), vegetarian capsule, hypromellose; anti-caking agent: vegetable magnesium stearate; antioxidant: ascorbic acid. For adults and children (from 1 year & up) Take 1 capsule daily with food, preferably with breakfast, or as professionally directed. Drink plenty of water with your course of live cultures. For anyone unable to swallow capsules, the capsule can be opened and contents mixed with a cold meal or beverage. Live cultures are not recommended for those with serious medical conditions eg. those who are severely immunosuppressed, have pancreatitis, are in the ICU, have melaena, have a central venous catheter, infants with short bowel syndrome, or to patients with open wounds following major surgery; unless under a doctor`s care. Below are reviews of OptiBac Probiotics - For Every Day - 90 Capsules by bodykind customers. If you have tried this product we'd love to hear what you think so please leave a review. This is my very first time of taking OptiBac Probiotics,so it's a bit early for me to give a fair review, but I'm looking forward to them making a difference to my highly sensitive bowel/dysbiosis. Very pleased with the service from Bodykind who provided a prompt delivery which was free of charge. The Optibac was reasonably priced and I will most likely order from them in the future. Great product, quick delivery, my wife and daughter take this daily and really feel the benefits. I have been taking these for three weeks and at first I thought they were OK and ordered a second batch, but I suddenly had a very bad reaction. Stopped taking them and felt a lot better. I have now returned them as being unsuitable. In spite of the general belief that probiotics are "good for you" they don't suit everybody. At first caused terrible wind problems which seem to have settled down, but it is too early to say whether there is any long term benefit. Trusted product, does help my digestive issues, especially after antibiotics. Bought for my daughter to help with digestive problems. She has used them previously. This product has excellent reviews on many health forums, it is too early for me to rate them yet, but I will be repeat ordering and trying them out for several months. These probiotics keep my jippy tummy able to digest it's food. Think it is a life long mission to keep tum on the straight and narrow, (too many antibiotics in the past and too long suffering). The really positive thing is now that my tum is mainly settled, I'm healthier too. People notice. If you are struggling with tummy issues do give these a try. So many of us are investigated every which way with nothing found. Yet we know were are unwell. I think we lack a full compliment of good bugs. The Drs don't yet look for that. It's taken a while trying different brands but this works for me. No harm in ringing the changes though with different formulas to widen your bug gene pool? The more good bugs helping digest our food the better! These probiotics have too much FOS fibre added and unfortunately I had to stop taking them after 3 days due to really bad stomach cramps and intestinal gas. Will return to using another in the range. excellent product. they have made a big difference to my digestion and tummy and bowel. I also thank customer services who were very helpful. Very good product, would definitely recommend if you have problems digesting certain foods, it settles your stomach. Excellent product. First-rate value for money. The advantages of a healthy gut flora have been documented in the scientific literature. I've found these have helped with boosting mood as well as digestive health. Was recommended probiotics for Son, found these were the only ones he could have in terms of his food intolerances. Order arrived very quickly and it was great to receive the extra item free! Split the capsule and add to his drink as he doesn't take tablets and that seems to work fine. Very pleased with the probiotics.